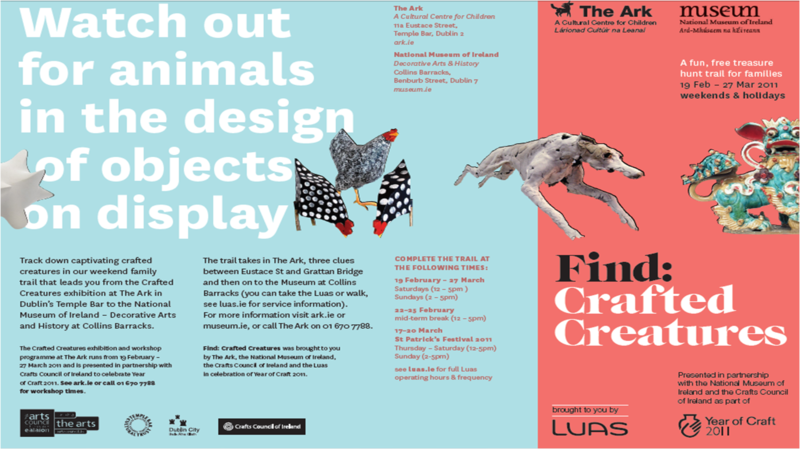 Find: Crafted Creatures was an innovative cultural treasure hunt developed by The Ark, Cultural Centre for Children and National Museum of Ireland. 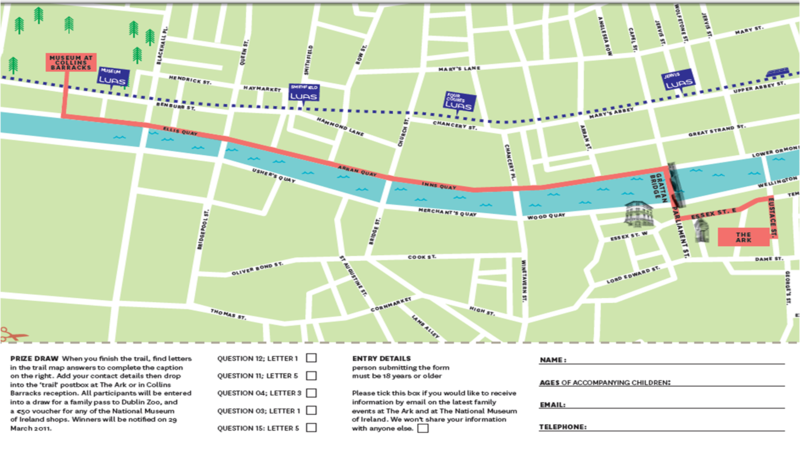 The treasure hunt was developed in response to visitor feedback at The Ark which had shown visitors often found coming to Dublin an expensive family day out. The Ark decided to challenge this perception by highlighting the many free National Museums in and around Dublin. The treasure hunt was designed as a way to encourage families to visit more than one cultural institution whilst in Dublin. Developing more family visits was already a key priority for National Museum of Ireland, Decorative Arts and History but working with The Ark provided direct access to families who were already in the city and interested in participating in cultural activities. Setting the stage for Dublin to be seen as a great family destination prompted LUAS the city’s tram service to sponsor the treasure hunt. The treasure hunt was themed around ‘Crafted Creatures‘ an exhibition that was on display at The Ark as part of the Craft Council of Ireland’s Year of Craft 2011. The hunt was realised through an A3 map which could be picked up at either National Museum of Ireland or at The Ark. Visually engaging, with rhyming clues the trail was child focused, with just enough practical information such as a street map to keep the adults informed. The treasure hunt provided a great way for families to get involved with the objects in the gallery, each question directed young visitors to a specific object about which they had to answer a question. A key element of the hunt were the 3 questions based on the journey between the two venues, this turned a boring walk, or tram ride into an interactive experience. The hunt engages families with cultural institutions but also the city itself. 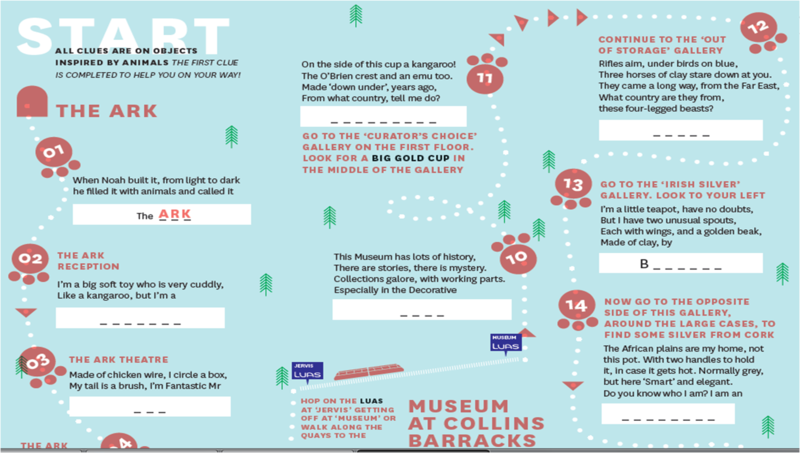 When complete the treasure hunt map could be entered into a draw to win a voucher for the Museum or a family ticket to Dublin Zoo. What this project demonstrates is the ability of collaborative partnerships to provide an innovative response to a problem. Here the problem for The Ark was a perceived lack of family friendly activities and centres apart from The Ark in the city. For National Museum of Ireland the problem was a need to increase family visitors numbers to meet funder targets. The collaboartive response to these problems led to better family experiences in the city, and more family visitors to the museum. Rather than developing an audience, this example shows that cross pollinating audiences through collaborative working can provide exciting outcomes for all the organisations involved. Murieann Sheahan, The Ark and Lorraine Comer, National Museum of Ireland discussed the development of the treasure hunt project at the annual Irish Museums Association ‘Blow your Own Trumpet’ event at The National Library of Ireland on 6th June 2011.